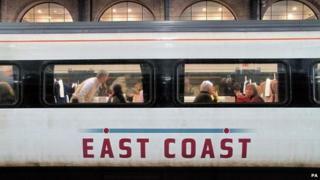 A joint venture between Stagecoach and Virgin has won the franchise to run the East Coast mainline rail route. The firms promised to invest £140m in the route over eight years, and will pay the government £3.3bn for the contract. The franchise, which covers the route between London and Edinburgh, has been publicly run since 2009. The RMT union called the return of the franchise to the private sector "a national disgrace". Virgin and Stagecoach already operate rail services on the West Coast main line. The Stagecoach and Virgin consortium, named Inter City Railways, will take over the franchise on 1 March 2015. Its plans include 23 new services to and from London, and 3,100 extra seats for the morning peak time by 2020. Inter City Railways is 90% owned by Stagecoach, but the trains will be branded 'Virgin Trains East Coast'. Martin Griffiths, chief executive of Stagecoach Group, said: "Passengers using the East Coast mainline will benefit from hundreds of millions of pounds of infrastructure investment and service improvements over the next decade." Transport Secretary Patrick McLoughlin said: "This is a fantastic deal for passengers and for staff on this vital route. It gives passengers more seats, more services and new trains. "I believe Stagecoach and Virgin will not only deliver for customers but also for the British taxpayer." Media captionSteve Hedley of the RMT : "The Tories are looking after their mates again"
The previous operator of the rail line, National Express, ran into financial difficulties, forcing the government to take control of the franchise. The government says it always intended to return the route to the private sector, but transport unions have been pushing for the franchise to remain in public ownership. FirstGroup chief executive Tim O'Toole said: "We remain committed to the rail market but we are dissatisfied not to have secured any of the franchises that have come up for tender in this first round." The East Coast isn't just any old line. It's the line Mallard used to break the world speed record. It's the home of the Flying Scotsman. So rumours that it was about to be handed to a group dominated by the French government started to get a lot of backs up. It turns out those rumours weren't true, the line's going to a consortium led by British companies Stagecoach (90%) and Virgin (10%). But it's still controversial. The current public sector owner has handed a billion pounds in premiums over to the Treasury since 2009. So the unions and Labour had argued it should have been kept in government hands. Meanwhile Virgin/Stagecoach now run both main lines going up and down Britain (East and West). Some are already saying that doesn't exactly encourage competition. Labour has said it wants to change the law to allow the publicly-owned firm which took over the running of the East Coast Mainline franchise in 2009 - Directly Operated Railways - to bid for other franchises. Shadow transport secretary Michael Dugher said he had written to the Department for Transport's permanent secretary asking him to postpone the East Coast franchise process. Mr Dugher said: "The taxpayer and the travelling public have been sold down the river. This whole franchise process shouldn't have happened. "East Coast has ... established itself as one of the best train operating companies in the country. Rather than rigging the franchise timetable in order to sell it off before the [general] election, David Cameron's government should have been putting the public interest first and working to get a better deal for passengers." Professor Stephen Glaister of Imperial College London, who has advised the government on transport policy, said the franchising process in the UK had been undermined by government bailouts. "The problem with franchising is that the basic principle of holding commercial bidders to promises has been violated by the government stepping in to bail them out," he said.